I wish I could say that I had been sewing in secret and that I had three finished quilts to show off…, but that just isn’t the case. Not much time devoted to my hobby at the moment. 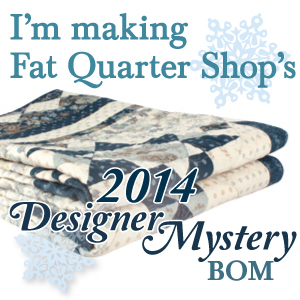 Last week, I did get done with the 9th block in the 2013 Designer Mystery BOM by Fat Quarter Shop. It is the last house block in the row quilt. The last three blocks are a mystery to me. We have had three basket blocks, three star blocks and three house blocks. I was only having to look for one piece of fabric to make my two blocks from one package this time. The facing of the house between the door panel and the roof line called for a 6″ square of fabric, and I only had a piece big enough for one. No worries though, last month’s package had a perfect piece that I used. And here they are together on my driveway! The more I look at my six house blocks, the more I know I will embellish with some creative embroidery when I’m done. Little doorknobs, and maybe some flowers in the window boxes. The next edition of Quilters Newsletter will be in my mailbox soon – I got the digital edition email yesterday. Three more ready to go! Finally, I celebrated a birthday yesterday. I had a great day, surrounded by wonderful friends at work and family at home. One of the ladies at work made me a beautiful pink fondant covered cake, with hand crafted roses. The kids had fun lighting and relighting the candles last night. Well, happy belated birthday! I hope the entire week is full of fun surprises for you! May you live as long as you want and never want for as long as you live! Cheers!! !